As Shirley Bassey would say, this weekend is all about a little history repeating. 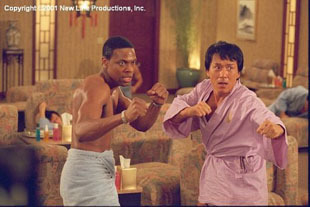 In September of 1998, a film starring the internationally-known - though considerably less so in North America - Jackie Chan and hyperactive comedian Chris Tucker shattered the September box-office record with a $33 million opening. Now its sequel, Rush Hour 2, is set to do the same for the August box-office record, currently held by The Sixth Sense at $26.68 million. It would take a monumental failure for this film to miss that mark. This is Chris Tucker's first film appearance since that breakthrough success, and while he hasn't built on it, there are also no embarrassing flops on the record either. Jackie Chan has himself only starred in one movie since then, last year's modest success Shanghai Noon. This represents a large change of pace for the generally prolific - 14 films between 1990 and 1997 - kung-fu action star. With the now de rigueur opening in over 3,000 (3,118 in this case) venues for wannabe blockbusters, all the elements are in place for this film to more than trump the original's opening. Both stars are returning, with a quite astute concept shift taking place (Chris Tucker goes to Hong Kong, reversing Jackie Chan's trip to Los Angeles in the first movie). In addition, Zhang Ziyi of Crouching Tiger, Hidden Dragon has joined the cast as one of the villains of the film. Commercials for the film, while not outstanding, have essentially resold the first film and the buddy-cop film is sure to be off to a rousing start. I predict a $46 million opening weekend and a third film in the series to be green-lighted by Tuesday. Hot on its heels will be last week's number-one film, brand-new three-day weekend record-holder Planet of the Apes. While the tendency is for films opening ultra-large to fall quite hard on their second weekends, I expect a slightly less steep drop. The main reason for this would be the "twist" ending of the film, which may bring viewers back for a second attempt to watch for clues, although they won't find them. It doesn't take much of a leap into cynicism to think that a deliberately misleading ending was tacked on to the film for this very purpose. A 45% drop will fall into the category of promising for this film, giving it an approximately $37 million weekend and a cumulative total of $134 million. Third place should be where The Princess Diaries finds itself at the end of the weekend. For director Garry Marshall, this rarest of beasts, a non-animated G-rated movie, should represent something of a bounce back from his last film, the truly awful and offensive The Other Sister, which deservedly flopped in March of 1999. This film looks to tap into a seldom-targeted group of filmgoers, pre- and early-teen girls. Starring newcomer Anne Hathaway, pop singer Mandy Moore and film legend Julie Andrews, this is a slight twist on Andrews' own breakthrough Broadway role in My Fair Lady. This film seems well placed for counter-programming against the big two films this weekend, and could do quite well in its niche. Opening in 2,537 venues, I expect this film to open in the neighborhood of $14-15 million. The third opener this weekend is the long-delayed thriller starring Angelina Jolie and Antonio Banderas, Original Sin. Originally scheduled for the fourth quarter of 2000, this film was likely pushed back to capitalize on Angelina Jolie's success in Tomb Raider. A shrewd move on MGM's part, as without that help this film may have only seen theaters as a limited or medium-wide release. There is also the added benefit of Antonio Banderas's Spy Kids earlier this year. As such, it is only being released in 2,194 venues. Despite all this, the prospects for the film look dismal, as the trailers and ads for this film have been quite gloomy and dull, and are having some difficulty bringing across the plot. An opening bow of $6-7 million is likely.